In today’s health care system we recognize that people need more than clinical treatment, they also need to be respected and treated with dignity, and in a fast changing industry with a shortage of qualified nursing staff, these key patient demands are easily lost. The role of the Certified Nursing Assistant (CNA) was created to perform many of the duties that patients require most, and as well to free up the time of a nursing team so they continue providing strictly medical services. The nurse assistant is often described as the eyes and ears of the registered nurses on staff and is expected to be more than just an onlooker, being called on to help in surgery, monitor patients, administer medications, help patients with hygiene and comfort, and much more. The work of a nurse assistant can be physically demanding, but is also thought of as emotionally rewarding. Nurse assistants will most often be found in hospitals and private care facilities and are employed to provide more people skills than medical skills, but at the same time needing to be able to recognize danger signs with patients and be able to respond calmly to emergency situations. After completing the State Tested Nurse Aid (STNA) course, all nurse assistants should have the basic skills to read vital signs and determine if a nurse or doctor needs to be called. Specific roles assigned can vary in different medical centers, with hospitals generally demanding more patient monitoring and grooming than other facilities such as rest homes, yet it is fair to assume the basic topics covered during the nurse aid training will be representative of the duties expected to be carried out. These include helping patients and residents with cleanliness, grooming, comfort, eating, and in many cases with motivation and communication. Hospitals aren’t the only environment where nurse assistants can be found, and with a growing demand for health care industry workers the nurse assistant now has a bewildering choice of employer, from public health centers, rest homes, private clinics, home based care, to general practitioners. All offer something slightly different in the range of duties and some offer career prospects that include nursing, administration, even psychology. The type of person who is attracted to nursing, and therefore to being a nurse assistant is the person with a strong sense of empathy for the needs of others. Psychologically these are people who have a strong feeling of belonging in their community and communicate well with others. Caring for the sick or elderly is a challenging job that requires complete commitment, and occasionally putting others first. To become a licensed nurse assistant, a federally or state approved course must be undertaken that meets the minimum requirements for learning, as well as pass a state exam under the supervision of a registered nurse. Courses are generally from 75 to 120 hours, and will always include a mandated minimum number of clinical hours for student assessment. Students should expect to learn about procedures for patient care, patient safety, sanitation and correct hygiene protocols, dealing with biohazardous waste, and medical terminology. Study can be full time or a combination of either evenings and one or two weekends, or weekends only. Usually it is not possible to work without completing a state recognized course and the exam, though in certain circumstances this requirement can be waived if the employee commits to taking and passing the course and exam within 120 days of starting employment. 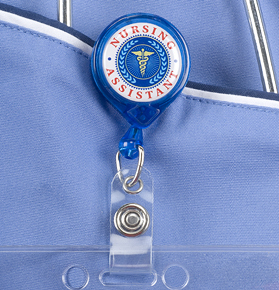 A certified nurse assistant is a healthcare professional even though the grade is considered entry level, but opportunities for advancement are good, with many nurses having started out as nurse assistants who then studied part-time on full pay. Compare 1-4 months of study to become a nurse assistant with the minimum 2 years to become a nurse and it isn’t surprising many nurses choose this route. After commencing work, most nurse assistants quickly discover there is more to learn than a short course can ever do, particularly when it comes to dealing with legal issues such as maintaining confidentiality when pressured by family of the people being cared for. Additional courses are frequently offered by large employers in the health care industry, and some at least should be considered mandatory for the new nurse aid. Training to be a nurse assistant should be exciting, and the beginning of a new career and it will be if the student comes into medicine with the right attitude. Being a nurse assistant isn’t a job, it is a vocation that can be enjoyed and be deeply satisfying, and the industry is one of the fastest growing in the US with more jobs unfilled than there are graduates.